Demographics in the United States are changing rapidly, and the 2012 presidential election was a clear illustration of the Unites States’ movement toward a more diverse population. Forecasts indicate by 2050, or even 2043 the United States will not only be more populous, it will also be a ‘majority-minority’ country. These demographic shifts will have major political, socio-economic, legal, and cultural impacts on public discourse and public policy. As certain groups—historically marginalized for their race, ethnicity/national origin, gender, sexual orientation, civic affiliation, or religious beliefs—become more visible, it is evoking a backlash from some who are eager to slow or reverse these groups’ growing political and legal enfranchisement. In a 2014 community brief, ISPU summarized the research and documentation of state-level legislative efforts to disenfranchise historically marginalized groups. This data visualization, newly updated for 2018, maps legislative efforts in all 50 states to restrict rights for a variety of marginalized communities. ISPU’s legislative map is an important conversation starter with other communities and allies. Unfortunately, Islamophobia is too often thought of, by American Muslims and broader society alike, as a unique problem directed at only one community: Muslims. 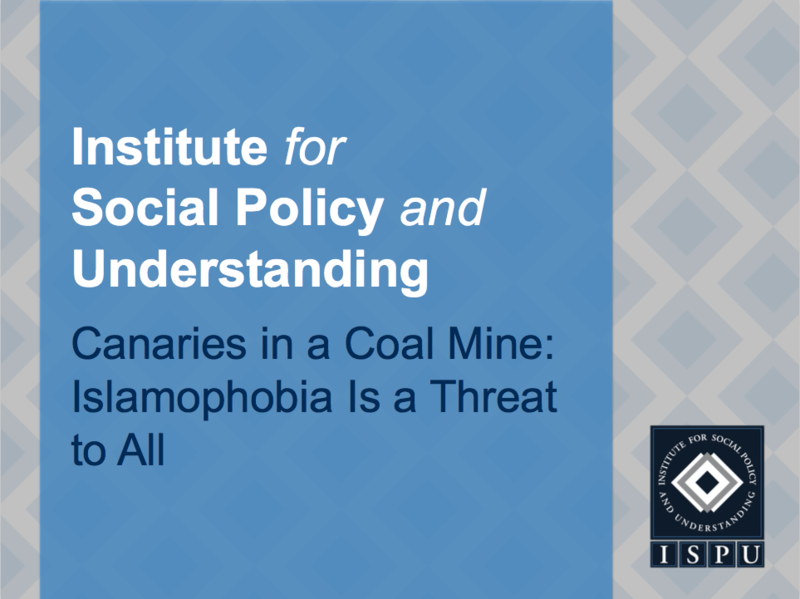 ISPU’s research shows that Islamophobia is a threat to all. Our map provides a big picture narrative, grounded in hard data gathered from over 3100 bills across all 50 U.S. states, which shows anti-Muslim bigotry is not an isolated phenomenon; it frequently overlaps with prejudices directed toward other communities. In other words, anti-Muslim prejudice isn’t just a problem for Muslims — it’s a problem for all Americans. Our legislative map is also a practical tool that provides you with the “value added” information for potential partners. Faced with a lawmaker who recently put out an anti-shariah bill and now your community is looking to build or strengthen partnerships with other communities? Moral arguments may be persuasive to some, but many others will only take notice if you can show how “your interests” and “their interests” are the same. Our data, made publicly available through this tool, shows how the same lawmakers that target Muslims also often support laws that disproportionately harm communities of color and others according to their national origin/ethnicity, civic association, gender, or sexual identity. It also contains legislative information on 1000+ state lawmakers from 2011 to 2017 across seven different issue areas, including anti-shariah legislation. This data visualization map allows you to quickly review the links between legislation targeting a number of historically marginalized communities on a state-by-state level. All the bills listed are taken from regular legislative sessions in all 50 U.S. state legislatures between 2011 and 2017. Clicking on a state from the map will filter the “List of Bills” to reflect that individual state’s data. Clicking on the selected state a second time will reset the map to show all states’ data. The table in the “List of Bills” area will update according to the filters applied by using the drop down controls on the right. Hovering the mouse over the “List of Bills” table in the “status” column will show a popup summary of the individual bill for each row. Clicking on one of the issue-specific tabs will adjust the map so you can better visualize the presence of each particular issue in all relevant states. 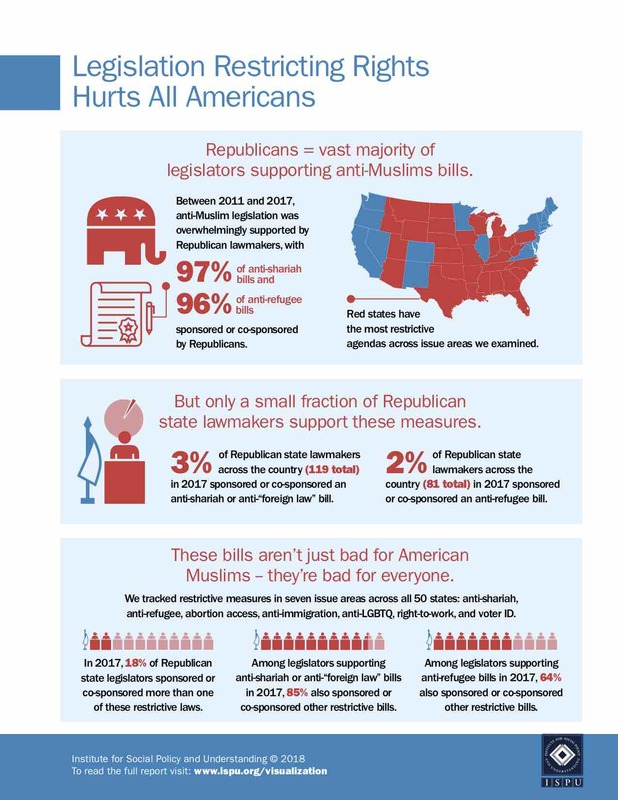 Want to explain how anti-Muslim legislation threatens the rights of all Americans? Use this presentation. Our analysis shows that the same legislators that target Muslims also often support laws that disproportionately harm other marginalized groups. See this infographic to learn more.